Happy Leyendecker Baby New Year 2012! As I’ve done every New Year’s Eve for the past six years, I’ll wish all Lines and Colors readers a Happy Leyendecker Baby New Year! In addition to crystalizing our popular image of Santa Claus (see my recent post), the great American illustrator J.C. Leyendecker originated the contemporary concept of representing the new year as a baby, starting with his New Year’s cherub that welcomed in 1907 on a December, 1906 issue of The Saturday Evening Post. He followed up in December of 1907 with an actual baby (sans wings) to represent the new year of 1908, and continued to represent the new year as a baby, usually portrayed as a personification of political or economic trends expected to be prevalent in the coming year, on into the 1940’s. The beautiful high-quality image at top is from Scribble Junkies, where you can find a somewhat larger version, also with other smaller images. Curtis Publishing continues to maintain (and is improving) its archive of Saturday Evening Post covers, including a section for J.C. Leyendecker covers in general and a new one specifically for New Years Babies. You can find some larger Leyendecker cover images on My-Mags.com and a large selection on Cover Browser. I wish everyone a beautiful new year filled with lots of wonderful art, both old and new! A recent comment from a reader on a post I did back in 2006 reminded me that I haven’t written for some time about the great science fiction, fantasy and horror illustrator Virgil Finlay. Though he worked in a variety of media, both in color and in black and white, Finlay is noted primarily for his astonishing ink illustrations, which were combinations of the meticulous and difficult techniques of scratchboard, crosshatch and stipple (the application of a myriad of tiny dots to make a tone). His proficiency in the medium was matched only by his outrageous imagination, and the combination made him one of the most popular and in-demand science fiction and fantasy illustrators of his time. Though his career spanned a longer period, Finlay was most active in the 1940’s in 1950’s when his illustrations appeared in numerous “pulp” magazines (so named because for the cheap grade of paper on which they were printed), and many of his images have a deliciously lurid pulp sensibility. Since I last wrote about him, some new sources for images of his work have become available on the web, though the links I pointed to in my original article are no longer valid (the internet giveth and the internet taketh away). Also unfortunately, the collections of his work printed in the 1970’s (like The Book of Virgil Finlay) and 1990’s (Virgil Finlay’s Women of the Ages, Virgil Finlay’s Phantasms, Virgil Finlay’s Strange Science and Virgil Finlay’s Far Beyond) are long out of print and have not been reprinted or compiled into a larger compendium as they deserve. However, you can still find used copies of some of them for reasonable prices. Finlay’s extraordinarily detailed work in particular shines in the high-resolution medium of print, especially in those collections, which were printed on much higher quality paper than the original magazines. There are, however, a few resources on the web with reasonably good images. One of the best is Golden Age Comic Book Stories (a blog with a much wider reach than its title implies, and for which I’ll issue a Major Time Sink Warning). My link is to a search which lists numerous posts in which Finlay is mentioned. If you’re inclined, keep clicking through “Older Posts” at page bottom, though they can be more or less relevant, the listed posts go on for several pages, and most images are linked to much larger versions. Another good, and probably quicker, glimpse at Finlay’s work is a post on Monster Brains. There are also several pages of images on Collector’s Showcase (note links to 5 pages at bottom). Finlay often brought scratchboard, hatching, stipple and deep chiaroscuro to bear in a single image, with masterful control of each technique. Though he was obviously influenced by pen and ink greats like Joseph Clement Coll, Franklin Booth and Howard Pyle, among others, Finlay created a style the was uniquely his own. For more on Virgil Finlay, see Jim Vedeboncoeur’s article on BPIB, the Wikipedia entry and my previous post. Like his contemporary, Hiroshi Yoshida, Kawase Hasui was a renowned woodblock print artist of the Shin hanga, or “new prints” movement in early 20th Century Japan. Also like Yoshida, Hasui traveled extensively and produced images of a variety of locations, though not as much outside of Japan as Yoshida. Instead, Hasui sought out remote landscapes within an increasingly industrialized and populated Japan. His prints are often of scenes in snow, rain, twilight or darkness, though bright sunlight can also play its part, and he can be wonderfully evocative of different atmospheric and light conditions. Many of his earliest prints, which are considered by some to be his best work, were lost in an earthquake in 1923. They must have been stunning because those that remain are extraordinarily beautiful. Since my previous post on Kawase Hsui, some new sources for images have become available on the web. In addition to the web resources listed below, there is a currently in print collection of his work Visions of Japan (Kawase Hasui). You can also find his work in broader collections of Japanese woodblock prints. While most of the best European art has remained in Europe, which is as it should be, a good deal has made its way into museums and collections in the U.S. and elsewhere, much to the delight of those who have access to it. An exhibition currently at the North Carolina Museum of Art, Rembrandt in America, looks at the the history of collecting Rembrandt paintings in the U.S. In what looks to be a remarkable show, 27 Rembrandt paintings have been assembled from numerous collections, along with another 23 works by his workshop, assistants and contemporaries that were at one time attributed to the master. Those who live in New York City with easy access to the Rembrandts in the Metropolitan Museum of art and the Frick collection may be jaded, but in the rest of the country the ability to see Rembrant’s work is much more rare, and a large grouping of his work such as this is unusual by any standard. The show includes works from private collections that are rarely seen by the public (images above, bottom two). Rembrandt in America is at the North Carolina Museum of Art from now until January 22, 2012. It then moves to the Cleveland Museum of Art where it will be on view from February 19 to May 28, 2012 (and will be accompanied by an exhibition of Rembrandt Prints from the Morgan Library and Museum), and ends its run at the Minneapolis Institute of Arts from June 24 to September 16, 2012. For those who can’t get to one of the venues in person, there is a rather disjointed image feature on the NCMA website. Clicking on any of the images opens them in a popup within which you can move back and forth, but the series is not always complete. I suggest starting with the eyes of the portrait at the upper right. Be sure to click on the easy to miss “MORE” link below the images for an additional series that contains some of the more interesting images in the exhibition. As with most museum exhibition previews, I recommend supplementing your viewing with the use of other resources. You can start by taking note of the sources for works on loan, and looking up the museums and collections to see if a better image is available there. For example, the Indianapolis Museum of Art has a better image of the wonderful self-portrait of Rembrandt as a young man that is part of the show. However, you can sometimes find even better images from other sources, such as an image of that same portrait as seen on the wonderful resource, Rembrandt Life and Work, which, though lighter, reveals more detail (image above, top). Another great resource for Rembrandt images is the Web Gallery of Art. You will find differences in color correction in the same image from different sources as well (including reproductions in books). Rembrandt’s work, to my mind, is best appreciated up close, and small images often fail to demonstrate his enormous visual power and remarkable brushwork and use of texture. 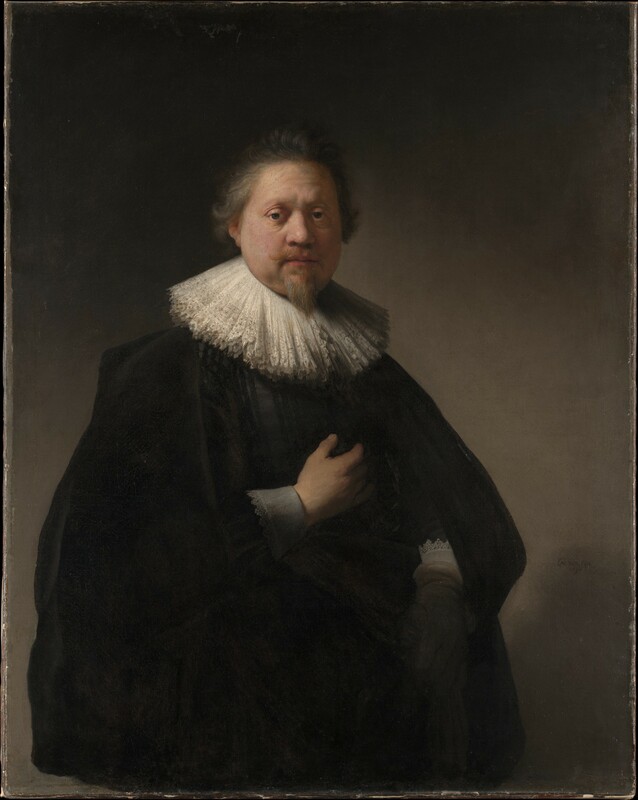 One of the best sources for detailed images of Rembrandt paintings is the beautiful new website of the Metropolitan Museum of Art (see my recent post), on which several images on loan for the exhibition can be viewed in detail, such as Portrait of a Man, probably a Member of the Van Beresteyn Family (above, second down, with detail, third down, high res version here). You can easily search the collections for Rembrandt paintings or for an individual title. From the image detail page, choose “Fullscreen”under the image. There is also a catalog accompanying the exhibition (Amazon link here). It’s easy to be misled by small images into thinking that Rembrandt’s work consists largely of a bunch of dark, earth colored portraits of stuffy burghers and Biblical scenes, but if you have the chance to see his work in person, to look into the depths of his multi layered glazes and astonishingly textural surfaces, you may discover why he is often at the top of the list of the best painters in the history of Western Art. I’ve written previously about a number of illustrators who are represented by Richard Solomon, a well known artists representative in New York whose list of represented artists reads like a who’s who of the top names in contemporary illustration. In addition to the portfolios of represented artists on the Richard Solomon website (for which I’ll issue a Time-sink Warning), Solomon has in recent months been posting sketches from a number of the artists on a Tumblelog called Warm Up Sketches + Working Process. 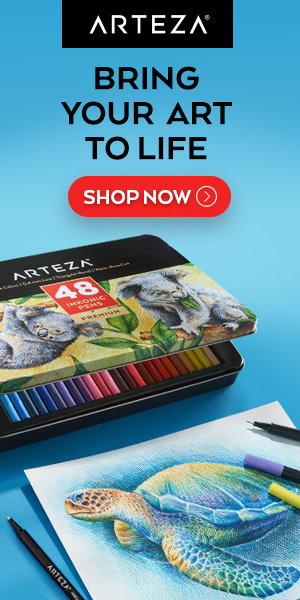 These run the gamut from personal sketches and sketchbook pages to preliminary roughs for illustrations to relatively finished drawings. Though a few of the links from the index page are broken at the moment, there is more than enough wonderful material here to make a visit well worthwhile. Many of the drawings and sketches are linked to the artist’s page on the Solomon website, or you can go in through the front of the site and look them up. Though I know of some of the Russian painters associated with the group known as the Peredvizhniki (“itinerants” or “wanderers”), Alexei (Aleksey) Kondratyevich Savrasov was one with whom I was not very familiar until recently (see my recent post Picturing Winter on Tor.com). With a little digging, I’ve found that he was actually one of Russia’s most important and influential landscape painters, and creator of the style known as “lyrical landscape” or “mood landscape”. Self-taught initially, selling small paintings to street vendors as an adolescent, he went on to study at the Moscow School of Painting, Sculpture and Architecture. He traveled and painted for a time, and returned to become an instructor at the Moscow School, where his students included Vasily Polenov, Isaac Levitan and Konstantin Korovin. in the early 1860’s, he traveled Europe extensively, and in England in 1862 attended the International Exhibition, of which he wrote: “No academies in the world could so advance an artist as the present world exhibition.” He came away particularly impressed with the work of John Constable and Swiss landscape painter Alexandre Calame. In the 1870’s Savrasov became one of the founding members of the Peredvizhniki, a group of like-minded Russian artists who rejected the restraints of officially approved academic painting and took their work on traveling exhibitions (hence the name, “itinerants”). His painting The Rooks Have Returned (above, top with detail, large image on Google Art Project) was part of their initial exhibition, and became very much noticed and influential (as did Savrasov himself) for embracing an approach in which truth to nature was utilized to convey emotion, a style known as “lyrical landscape”. The end of his life was marked by tragedy, following the death of his daughter, an artistic crisis and a descent into alcoholism, leaving him destitute and homeless until his death in 1897. Reportedly only the doorkeeper of the Moscow School of Painting and Pavel Tretyakov, founder of the Tretyakov Gallery, attended his funeral.